Baugh's Blog: Book Review: Charles Dickens 1 - "Sketches by Boz"
Book Review: Charles Dickens 1 - "Sketches by Boz"
Charles Dickens began to write in the summer of 1833, at the age of twenty-one. He had been working as a parliamentary reporter for several newspapers and periodicals, but now he set about the serious intention of becoming a writer of fiction. Dickens was invited to submit more work, and over the next few months about ten more sketches were published by the Monthly Magazine. And as his work began to be noticed and appreciated, it got picked up by other periodicals. And then in August of 1834 a funny story called “The Boarding House” was finally attributed to its young author, but under the pseudonym of ‘Boz’. Boz was a nickname that Dickens had come up with for his younger brother Augustus. It began actually as Moses – after a character from Oliver Goldsmith’s novel The Vicar of Wakefield. Soon the nickname came to be delivered facetiously in a nasal tone – instead of Moses, it became “Boses”. And in time, Boses became shortened to “Boz”. So, although most people pronounce Charles Dickens’s early pseudonym so that it rhymes with ‘was’, it is really supposed to rhyme with ‘nose’. Dickens continued to write sketches as Boz for a couple of years. Eventually, they were published in a two-volume set by John Macrone on February 7th, 1836 – Dickens’s twenty-fourth birthday. A “second series” was released in one volume in August 1838. The volumes were called Sketches by Boz. The book collection was also published in installments by Chapman and Hall from 1837-1839; these usually included two black-and-white illustrations by artist George Cruikshank – wood engravings or metal etchings. The release of the first book of the sketches brought its author instant celebrity. About a month later he was commissioned by Chapman and Hall to write his first serialized novel. It was to be about a men’s sporting club – an idea that Dickens turned into The Posthumous Papers of the Pickwick Club. 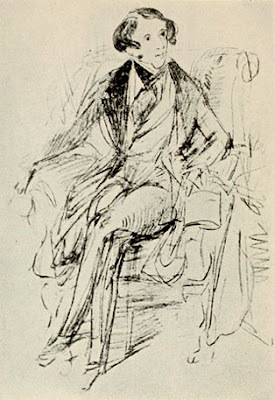 Dickens’s authorship was shown on the title pages as “Edited by Boz.” Six weeks after the first edition of the Sketches of Boz, the first installment of The Pickwick Papers was issued. Dickens rapidly shot to fame – especially after he introduced the character of cockney Sam Weller as Pickwick’s valet in Chapter 10. But he continued to write and submit sketches even as he was focused on writing his first novel. The full title of Dickens’s collection of early sketches was Sketches by Boz: Illustrative of Every-Day Life And Every-Day People. The final version of the work consisted of 56 sketches in four groups: “Our Parish”, “Scenes”, “Characters”, and “Tales”. The best writing here is in the sketches, where he writes with a wry attention to detail and a sense of ironic humour; in the tales of the final section, he often relies on dramatic and melodramatic cliches. I found it difficult to plough through the book. Unlike other very long works of his, which can often be read through in a week (once you get hooked by the plot and attached to the characters), this can be heavy-going. And there is no plot-arc to pull you along. Some of the drama is over-the-top melodrama (“The Black Veil”). Some of the satire is heavy-handed. Much of the writing is poorly done – heavy with modifiers and full of stereotypes and clichés: “He wiped off the concentrated essence of cowardice that was oozing fast down his forehead” (“The Great Winglebury Duel”). And familiar Dickensian scenes and situations emerge: late-night or early-morning strolls through the streets of London; boat cruises down the Thames to the northern-coast of Kent; lonely spinsters and ineffectual bachelors looking for love and marriage prospects; social gatherings full of pomposity and disaster. 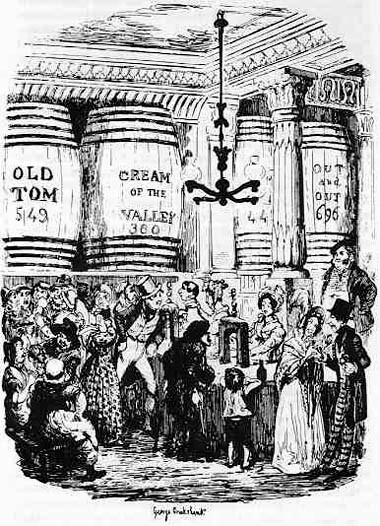 You can see how Dickens is seizing on everything he observes and experiences – using his imaginative power to turn it into fiction full of observed-detail and sympathetic characterisation. 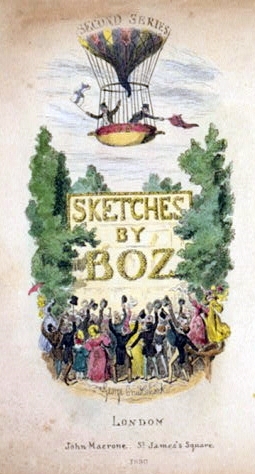 Sketches by Boz is not for a newcomer to the work of Charles Dickens. If you’ve never read a Dickens novel and want to try one of his early works, pick up Oliver Twist - if you want drama and story – or The Pickwick Papers, if you’re looking for humour and picaresque adventure. I would only recommend Sketches by Boz to those who want to read everything of his, or to those keen to witness the creation of a style, the development of a voice, and the emergence of a social conscience. I like this review Clive. "He wiped off the concentrated essence of cowardice...." That sounds very like a teenage school boy who's hormones are infecting his imagination. I have never read Sketches by Boz, I might do one day, however I am not a completist as you succinctly put it, I'm more of a dip into everything sort of person trying novels at any stage of an authors life.A kind of a randomness has pervaded my reading habits.That's it, I'm a randomist!!!! I quite often go back to authors though and read some more. I have done this over the years with Thomas Hardy and Graham Greene.Other authors too. Yeah, I'm like that, too. With music, if I really like someone, I tend to want to get everything they've put out (Dylan, Van Morrison, Neil Young, Leonard Cohen, etc.). With books, it's a matter of time available. I dip into writers' work, too. I've read a few Hardy novels (did some in university), a fair number of Greene - who I really like. We used to have a reading club at work. Everyone involved had the chance to recommend a book. I chose "The Heart of the Matter" by Greene, a novel I really loved. They hated it! They couldn't see the point. No acquaintance with Catholic guilt, I suppose! Or no sense of the dark side of life. I was kind of shocked that they couldn't relate to, or appreciate, his work.